Yes, 40 pounds. It’s estimated that, on average, a collective 40 pounds of dust will coat the surfaces of your home within in a year. All of that comes from dead skin cells, pollen, human and animal hair, fibers, and minerals from the soil. Now, you’d never actually see your home get that dusty. We regularly sweep our floors and dust off our tables and shelves. 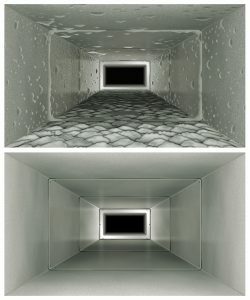 But there’s one place that we neglect to clean every day, simply because we can’t reach it: The inside of your air ducts. So imagine all the collective dust that enters our home every year, and it’s easy to see how it will collect in the air ducts without our knowledge. Aggravated asthma and allergy symptoms. The rooms get dusty again soon after dusting them off. You can see dust hanging from the intake vents. You haven’t had your ducts cleaned in more than 3 years. Dust and moisture are the two ingredients that create mold. As we just explained, your ducts can collect plenty of dust, which includes the proper nutrition for mold, such as dirt, dead skin cells, pollen, and animal dander. And as for the moisture? Well, we don’t have to tell you that Florida is one of the states with the highest humidity. Under the right conditions, your air ducts could become a breeding ground for mold, and it’s all the more likely here in Florida thanks to our climate. You can see mold growing in the intake vents. You’re feeling headaches or nausea only while inside your home. There’s a moldy or mildew-like smell through parts of the house. A proper duct cleaning in Miami is not something that just any homeowner can do. Now, that’s not because we doubt anyone’s abilities to clean. It has more to do with the fact that the ducts are so inconveniently situated that it takes special tools and expertise to reach inside them and perform a proper cleaning. Simply shoving a duster brush in the vent openings will only pick up some of the mess. Plus, doing this can actually loosen up more of the dust, making it even worse when you turn your HVAC system back on. Is it time for a duct cleaning? Contact Air On Demand to schedule a service.